The circuit given below is of a telephone operated DTMF remote. The circuit can be used to switch up to 9 devices using the keys 0 to 9 of the telephone. Digit 0 is used to switch the telephone system between remote switching mode and normal conversation mode. IC KT3170 (DTMF to BCD decoder) is used to decode the DTMF signals transmitted over the telephone line to corresponding BCD format. IC 74154 ( 4 to 16 demultiplexer) and IC CD4023 (dual D flip flop) is used to switch the device according to the receive DTMF signal. The operation of the circuit is as follows. After hearing the ringtone from the phone at receiver end, press the 0 button of the remote phone. The IC1 will decode this as 1010.The pin 11 of IC2 will go low and after inversion by the NOT gate in IC3 it will be high. This will toggle the flip flop IC5a and the transistor Q1 will be switched on. This will make the relay K1 ON. The two contacts C1 and C2 of the relay K1 will be closed. C1 will form a 220 Ohm loop across the telephone line in order to disconnect the ringer from the telephone line (this condition is similar to taking the telephone receiver off hook).C2 will connect a 10KHz audio source to the telephone line in order to inform you that the system is now in the remote switch mode. Now if you press 1 on the transmitter phone, the IC1 will decode it as 0001 and the pin 2 of IC2 will go low. After inversion by the corresponding NOT gate inside IC3, it will be high. This will toggle flip flop IC5b and transistor Q2 will be switched ON. The relay will be energized and the device connected through its contacts gets switched. Pressing the 1 again will toggle the state of device. In the same ways Keys 2 to 9 on the transmitter phone can be used to toggle the state of the device connected to the channels O2 to O9. After switching is over, press the O key on the transmitter phone in order to toggle the flip flop IC5a to de-energize the relay K1.The 200 Ohm loop will be disconnected from the line, the 10 KHz audio source will be removed and the telephone receiver will be ready to receive new calls. Use 6V DC for powering the circuit. A simple NE555 based oscillator can be used as the 10 KHz audio source. All ICâ€™s must be mounted on holders. The section drawn in red must be repeated eight times (not shown in circuit). In certain countries circuits like this cannot be connected to telephone line.I do not have any responsibility on the legal issues . ICâ€™s used in this project. The IC KT 3170 used here is a low power DTMF receiver IC from Samsung. The IC is fabricated using low power CMOS technology and can detect all the 16 standard DTMF tones. The DTMF signal received will be decoded to a BCD output for switching applications. 74154 is a 4 line to 16 line decoder from national semiconductors. It decodes a 4 bit input code into one of 16 mutually exclusive outputs. Maximum supply voltage is 7V and normal power dissipation is around 175mW. CD4049 is a CMOS hex inverter from Texas Instruments. Each of the IC contains six NOT gates. Maximum supply voltage possible is 20V and each gate can drive up to two TTL loads. CD4013 is a CMOS dual D filp flop. Each flip flop has independent data, reset Q, Qbar, clock and set pins. The maximum possible supply voltage is 15V and the IC has high noise immunity. please sir can I have the full detailed circuit diagram using mobile phone to connect to the “line in” . thanks. and secondly can u help me with the circuit of Wilkie talkie. thanks. please sir can I have the full detailed circuit diagram using mobile phone to connect to the “line in” . thanks. hlw sir i am frm nepal.can i get the components and where?Plz give me the way to buy, these…. Hi Does anyone know anything about circuit boards for solar powered telephones? can we get these redimate ckts from this site??? can you please send the entire details of this project. The kt3170 has a latching output thus if you press 1 the dtmf decoder outputs a latched outoput to the demultyplexer and pushing 1 again will do nothing beacuse the demultyplexers input is latched. However if you add a npn transistor to the circuit between the dtmf chip and the multiplexer it will update with each button press. Bc547 emitter to ground then pins 18 and 19 of the demultyplexer to the collector of the transistor and base of the transistor through a resistor 4.7k to pin 15 of the dtmf chip. can you send me the full details of this project. Hello, you be so kind to send me the pcb. thank you very much. sir ! can u plz expllain with the details ,working and pcb layout of this project!! Hi,can you send to me the pcb layout of this project? great post i just got in to remote controlled gadgets myself! It is my 2nd week in electrical circuits World! Although, I spent 2full hours understanding the hall idea, and so impressed. for this circuit? If Yes, What are the required modification/s. And what is value of thermistor? Hi!! can u plz provide with the details ,working and pcb layout of this project!! We will create a PCB layout for sure, but it will take time. We are currently working on PCB layout for all our circuits. in my phone there is no lan connection if u tell me for any interconnection from circuit or if we connect fax machine to cradle and dial no. by keypad will the fax machine works plz help??? how can i connect a wireless phone to the fax machine plz tell me? can i modified this circuit that if i dial any number from my mobile to my land line no. switch on & off the devices???? 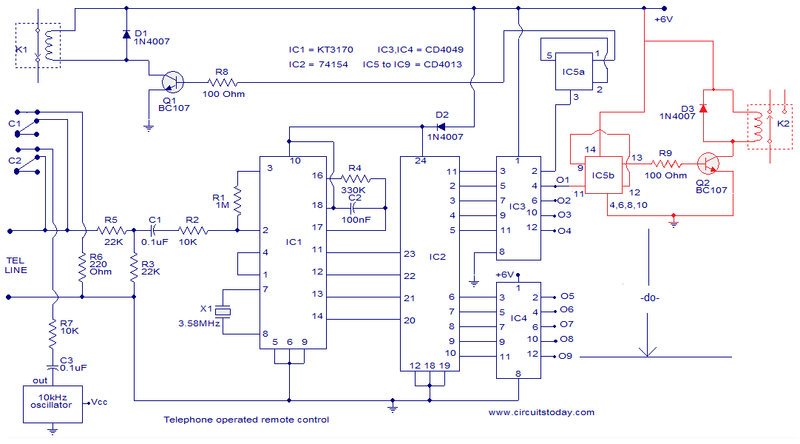 can i modified this circuit that i dial any number from my mobile to my land line no. switch on & off the devices???? KT3170 issue = this IC as I heard, was already discontinued. If that is true, what IC number can I replace in order this circuit to work as intended? Thanks for the attention to this query. Hi Adnan as per the text first time you push 0 to 9 any number, say 4 is pushed then that connected equipment to 4 will be switched on again you press the same number 4 the equipment will be switched off. if you press again it will be switched on etc. i have not yet tried this. how can i on off the appliance? how can i off and on the devices i cant understand the above working tell me the working in easy words?